The Phalaenopsis orchid is often called the Phal by some gardeners. This species is one of the most commonly used for plants and bouquets. The thick moth shaped flowers have a unique appearance many love. 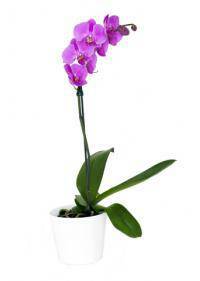 With some basic care, the Phal is very easy to grow in any home. Even those new to caring for houseplants can care for these flowers. By monitoring the soil conditions, regular flowers can be possible. Cultivars offer many unique changes to the color and shape of blooms. Some may have a shaped lower "lip" while others have thicker petals. Solid colors, as well as variegated speckles may be present on petals. Many prefer to grow or use the basic hybrid Phalaenopsis flower. The more commonly available hybrids feature pinks, whites or purples. Special cultivars may be available through garden centers or florists. P. Mambo is a hybrid that features a unique narrow shape for petals. The flowers are often red, white and yellow in a speckled pattern. Petals are spread further apart and appear longer than normal blooms. Artificial hybrids may also exist and can be easier to care for. Some of these may offer different color combinations or more blooms. The shape of the flower may also be changed through cultivation. Orchids have a reputation for being difficult to grow and reflower. While some special care is necessary, growing the plant is simple. This allows many gardeners to add them to their home or garden. Climate is essential when planting a Phalaenopsis orchid outside. In many colder climates, the plants will not survive for very long. For this reason, many prefer to use containers for outdoor use. Tropical and very humid climates are needed for any outdoor plants. To create this, a warm location and a moist pebble tray can be used. Once the weather begins to cool, plants should be moved indoors. For growing indoors, humidity is equally important to the plants. Light misting and a pebble tray are key to stronger growth periods. Keeping the humidity levels balanced can lead to easy reflowering. Indirect light is critical for both indoors and outside containers. Direct sunlight can lead to the leaves burning with regular exposure. Several hours of diffused light daily is important for many species. Potted and cut forms of Phalaenopsis Orchids are purchasable for delivery to Cleveland, OH, Peoria, AZ, Beaverton, OR, Henderson, NV, and Bakersfield, CA. While the potted orchid plants can last for years, cut orchids last up to a few weeks. The exotic flowers are widely used for many occasions and holidays. Plants may be added to live arrangements or given on their own. Cut flowers may be added to a number of bouquets for many events. The most common meaning for blooms is that of exotic and rare beauty. For this reason, they are frequently used in romantic arrangements. The bloom color may also have some impact on the intended meaning. Pink blossoms can represent fun and flirty passion between lovers. Pink can also represent playfulness and high spirits between friends. Deeper colors can show a deeper level of feelings toward someone. White orchids can be used to represent uniqueness or innocence. The meaning may shift depending on whether extra colors are present. Whites with purple centers are popular among many of the hybrids. The cut blooms are often seen in delicate wedding and bridal bouquets. They are often mixed with other exotic flowers in similar colors. A Phalaenopsis orchid can add a glamorous touch to any bouquet.